Before I present the second part of my discussion about the relevance of re-nationalisation to what I would call a truly progressive policy agenda, we have to take a step backward. I note after the first part – Brexit signals that a new policy paradigm is required including re-nationalisation – there were a few comments posted (and many more E-mails received – apparently readers are happier berating me personally rather than putting their ideas out in the public domain) that I was advocating a return to the ‘bad’ old days of nationalisation where cronyism, inefficiency and trade union bastardry were the norm. The obvious next point was – how can I claim that is progressive and part of the future. In this two part blog (the second part will come tomorrow), I offer a framework for assessing these claims. Today’s blog foscuses on the neo-liberal vision of efficiency and reveals how narrow and biased towards private profit it is. In Part 2 (tomorrow) I will present the progressive vision and how it conditions the way we think of efficiency. Once we break out of the neo-liberal constructs and refocus our attention on Society rather than the individual then the way we appraise policy options also changes – it becomes enriched with new possibilities and understandings. We enter the progressive world and leave behind the austerity nightmare that neo-liberalism has created. We are then able to see how our old conceptions of nationalised industries or public sector job creation are tainted with these neo-liberal biases. And we are then able to see how policy initiatives that invoke scorn from the conservatives and many so-called modern progressives (obsessed with post modern constructs) have a vital role to play in a truly progressive manifesto. I split the discussion into two parts because the blogs are too long as they are. This blog is part of Part 3 of next book (with co-author, Italian journalist Thomas Fazi), which is nearing completion. Part 3 will present what we are calling a ‘Progressive Manifesto’ to guide policy design and policy choices for governments that are struggling to see a way beyond the neo-liberal macroeconomics which we posit blights any hope of mounting a progressive agenda. We also hope that the ‘Manifesto’ will empower community groups by demonstrating that the TINA mantra, where these alleged goals of the amorphous global financial markets are prioritised over real goals like full employment, renewable energy and revitalised manufacturing sectors is bereft and a range of policy options, now taboo in this neo-liberal world, are available. As I have noted before, Part 3 will consider the following specific policy topics (re-organised from previous presentations), framed within an exposition of Modern Monetary Theory (MMT) and a progressive language. 1. Environmental constraints on growth – the need for growth and the change in composition of growth. The use of regulation versus the price system to engender resource allocation changes – for example, carbon taxes (price system) versus legislated bans on polluting activities (closure of coal mining etc). The role of the public sector as an investor, producer and employer in shifting growth priorities. 2. Employment guarantees versus income guarantees – role of work in society, use of job guarantees as a means of shifting perspectives on productive work. The rise of robotic manufacturing etc. Understanding the concept of efficiency in a societal sense as opposed to narrow private profit-based conceptions. 3. The entrepreurial state – the role of government in the innovation process. The concept of brainbelts replacing rust belts and the revitalisation of manufacturing (away from cheap towards smart). 4. External sector constraints – understanding the power of financial markets viz-a-viz the state. Understanding when capital and import controls (trade protection) are appropriate. Free trade myths and the gains from fair trade. 5. Reducing income and wealth inequality and household debt dependence – redressing the growing gap between real wages growth and productivity growth and the increasing reliance on private credit growth for growth. Restoring the role of trade unions as progressive forces. 6. Addressing the unproductive nature of financial markets – financial market regulation and bank reform – bank nationalisation – outlawing significant financial market transactions. Critiquing financial regulation that relies on the price system (Tobin Tax proposals etc). 7. Returning to a mixed economic vision with state planning – abandoning the concept of the self-regulating ‘free’ market, advancing the role of the state in the production and distribution system. Arguments to support the re-nationalision of key industries, taking the example of pre-1980s France as a positive case study. 8. Re-writing the international framework’, with proposals for redesigning the international funds system, including the dismantling of the IMF and replacing it with a new body that will help poor nations survive balance of payments problems (for example, when they are dependent on imported food or energy). We will demonstrate that a progressive manifesto that recognises the power of the state also acknowledges the importance of the international dimension by contrasting internationalism against supranationalism! 9. Moving beyond the post modernist progressive trap. As background to most of these topics, we thought a discussion of what we mean by efficiency is important because the way we construct that concept determines how we evaluate the propositions we are advancing. For example, one of the oft-repeated claims that large-scale public job creation programs (like a Job Guarantee) are wasteful, ‘make work’ schemes that lead to the economy’s resources being utilised in sub-optimal ways. The critique is based on what we consider to be a narrow-based conception of efficiency, the type that dominates mainstream economics. The mainstream neo-liberal version of the concept that economists like to repeat ad nauseum seems to think it is efficient to have 25 per cent unemployment (and 50 or more percent youth unemployment in some cases) as long as the fiscal balance is in surplus or below some ad hoc threshold. This private cost and benefit construction of what is efficient and what is not is bereft of credibility in a progressive vision which evaluates things in terms of society rather than economy, human well-being rather than private profit. The other example, which came up last week (as noted in the Introduction), were the claims that the nationalised industries in 1050s and 60s Britain were havens of waste and inefficiency as they were in other nations during that period. By what reckoning would we draw that conclusion? Once we broaden our view of efficiency then some of those conclusions become meaningless. They are just neo-liberal constructions and concepts deployed to advance a particular class interest at the expense of society and the workers within it. So this blog is about how we think of efficiency as a precursor to developing the components of our ‘Progressive Manifesto’. When we talk about re-nationalisation, capital controls, banking regulations, or using fiscal stimulus, there is a tendency, even among progressives to shrink and accuse us of being anachronistic Keynesians, harking back to the 1950s as if that decade or thereabouts was some sort of nirvana. Can’t we see that the world has changed irrevocably and that the old, labour intensive, state run industry with big deficits and lots of regulations that restricted how the private sector operated is no longer possible? Are we so out-of-touch that we cannot see all of this? Well let us get one thing absolutely clear from the outset. The 1950s were not nirvana! That is obvious. The conditions in the immediate Post World War 2 period were fairly dire as nations struggled to reconstruct and restore production capacity and distribution channels etc. Trade unions were largely male-dominated institutions that exhibited many of the prejudices that we now seek to expunge – racism, homophobia, sexism, ageism etc. The growth of heavy industry was encouraged without any real understanding of the long-term consequences for the impact on the natural environment. Work was, in many instances, repetitive and boring, and often conducted in unsafe and harsh conditions. In many cases, the publicly-owned industries were riddled with cronyism and unions often played a destructive role, but then there was no monopoly on the cronyism, corruption and poor decision-making in the public sector. All organisations can lose their way, irrespective of ownership status. So when we say we can make a case to re-nationalise the railways, for example, we have a vision that is not remotely like the 1950s state-owned and run railway systems around the world. And, when we say that we want to develop policies that revitalise manufacturing, we are not envisaging going back to dirty, boring jobs on assembly lines that deployed swathes of unskilled or low-skilled labour in the 1950s and 1960s. We are thinking about smart, high-skill manufacturing of high technology components and using manufacturing to help assist other goals, such as repositioning production to be environmentally-sustainable. That vision is light years away from where we have come from. The dinosaurs are extinct. We cannot bring them back! 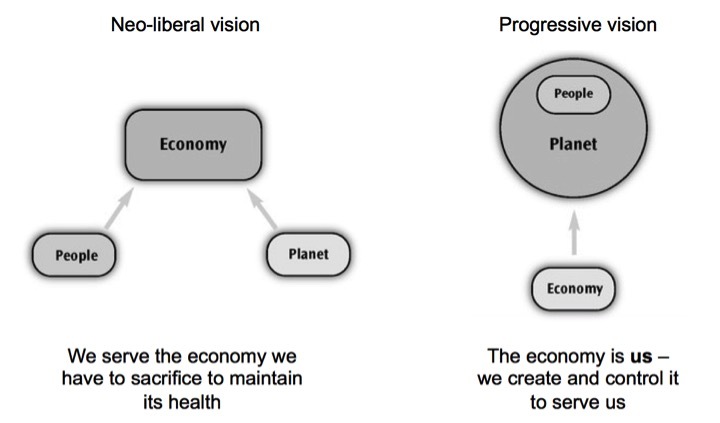 To cement an overall vision, consider the following two-panelled diagram, which might be summarised with the epithet: Its about Society not the Economy! I have produced a version of this graphic before. But it is very useful as a way of motivating notions of efficiency. The graphic is derived from Anat Shenker-Osorio’s 2012 book – Don’t Buy It: The Trouble with Talking Nonsense about the Economy and provides two alternative visions of the way we think of the people, our natural environment and the economy. Understanding the differences between these visions helps us understand different constructions of the concept of ‘efficiency’. It was also the period that unemployment persisted at high levels in most OECD countries. The two things are not unrelated. Unemployment arises because there is a lack of what we term to be collective will. We have been indoctrinated to believe that government is somehow an impost on us rather than being the essential facilitator for economic well-being. We support governments, which deliberately constrain aggregate spending below the level necessary to maintain jobs for all, which in turn, creates a class of unemployed who become dependent on increasingly pernicious welfare regimes. Income support when unemployed used to be considered a right of citizenship and, typically, of a short-term duration, as new jobs emerged with government fiscal support. In this new neo-liberal world, income support is vilified as bludging of the hard work of others. This narrative is reinforced on a daily basis by a virulent media aided by a bevvy of right-wing think tanks, which heaps scorn on the victims of the jobs shortfall as if the unemployed individuals are to blame for their own plight. We have been dumbed down to eschew previous understandings – that systemic constraints in the form of the failure of the system to produce enough jobs – renders these individuals powerless to change their circumstances. If there are are insufficient jobs generated someone must miss out! We now deny that basic reality of macroeconomics. If there are insufficient jobs we now lay the blame on sloth or other attitudinal deficiencies of those standing, desperately, in the jobless queue. We have been schooled to think individual and ignore the collective. The demise of collective will in the public setting has been a principal casualty of the influence of neo-liberalism. But it went too far. If children have a problem, it is society that is at fault. There is no such thing as society … There is living tapestry of men and women and people and the beauty of that tapestry and the quality of our lives will depend upon how much each of us is prepared to take responsibility for ourselves and each of us prepared to turn round and help by our own efforts those who are unfortunate. There is no such thing as Society! This is the vision laid out in the left-panel of the graphic. And, unfortunately, that mentality has even infested the progressive movements and their political organisations. This Manifesto is designed to disabuse progressive thinkers of this mentality and to, once again, create a widespread understanding of macroeconomic constraints wrought by insufficient spending and the way those constraints push disadvantage in multiple forms on some of our fellow citizens. The neo-liberal narrative tells us that a competitive, self-regulating economy will deliver maximum wealth and income if it is ‘allowed’ to operate with minimum government policy intervention. Governments have a restricted role to play, which is generally limited to maintaining property rights so that private benefits are secured and to maintain defence again foreign incursion. While this mimimalist role is the public dogma, the reality is that the neo-liberals desire the state to play a much more significant role which can be summarised as ensuring profits are privatised and losses are socialised. There was little complaint made when the national governments bailed out the banks during the early days of the GFC and protected the perquisites of the senior managers that created the problem in the first place. Public deficits for that purpose didn’t seem to matter! Once the position of financial capital was secured by the rising fiscal deficits, then the scorn resumed and governments were told they had to cut deeply into the spending that was of assistance to the most disadvantaged in our society. So within the masquerade of self-regulation and efficiency of the market is a deep hypocrisy that reveals that class interests are alive and well and will use the state and its fiscal capacity whenever it can advance the self interest of capital and eschew it otherwise. In the neo-liberal vision, the economy is elevated to the level of a ‘deity’, whose purpose is, somehow, removed from the people, even though this ‘deity’ recognises our endeavours and rewards us accordingly. We serve the economy. That is our purpose. Our natural environment also is seen, largely as a free resource, to assist private entrepreneurs in their profit-seeking ventures. People are required to have faith (confidence), work hard and make the necessary sacrifices for the good of the ‘economy’. It follows that those who are disadvantaged must have refused in some way to make these sacrifices and as a result are rightfully deprived of such rewards. They are miscreants – recidivists – sinners! The overtones of morality are never far from the surface. In mainstream university textbooks, economics students learn about robustly independent income earners and those who have ‘chosen’ to be welfare dependent. The economy is also figured as a living entity. If the government intervenes in the competitive process and provides an avenue where the undeserving (lazy, etc.) can receive rewards without due sacrifice then the system becomes ‘sick’. The restore the health of the economy, the government has to abandon regulations and other interventions such as minimum wages, job protection, and income support. The key messages are ‘self-governing and natural’, which force the obvious conclusion that we are better off when government cuts spending and allows the market to adjust to this ‘natural’ state. This narrative engenders a particular concept of efficiency. Students rote learn that a ‘freely competitive market’ will maximise efficiency because individuals determine through their desire to buy how much they value particular goods and services and the prices firms offer these goods and services at are an indication of the cost of resources used in their production. The desire of consumers is to maximise their satisfaction from the goods and services they buy and producers desire to maximise their profits by minimising their costs while supplying what the consumers demand. By coming together, the two sides of the market (demand and supply) ensure that the available productive resources are allocated to production in such a way that the economy maximises the production of goods and services aat the lowest cost. This is what the mainstream economists consider to be a state of efficiency. It is based on the ‘costs’ that the private producers incur rather than the total costs of production and is focused on private profits and the satisfaction of those who have the cash resources available to facilitate purchases. The neo-liberal concept of efficiency does allow for market-failure where the true costs of a productive activity are not reflected in the private supply costs of the firm and are thus not reflected in the final price we pay in the goods and services we buy. As a result, the ‘market’ over-allocates resources to those particular products and ‘fails’ to achieve efficiency. The most obvious divergence are the so-called negative externalities arising from say air or water pollution which the firm does not pay for. According to the mainstream economic theory, in these cases, efficiency is maintained as long as the government guarantees property rights so that the pollution can be properly priced in the market so that the true costs of all resources used in production are reflected in the final price of the supply product. Accordingly, the problem of environmental pollution and resource depletion is seen as a problem of incomplete specification of property rights such that the market price for the use of the natural resources is unable to be correctly arrived at. For example, a firm might emit pollution in a river which impacts on people downstream. But if there are no enforceable property rights on that river then the firm will not consider the ‘cost’ of that pollution and thus overproduces the product that causes the emission. The mainstream approach is to argue that the property rights to clean water should be defined and enforced which would give those downstream, legal recourse to push the ‘price’ of the product up, and, according to market logic, drive the demand down to some optimal and equilibrium level – reflecting the true use values and costs. This approach ignores the obvious question: What if the river dies and cannot be replaced in the same way that a worn-out piece of machinery can be replaced or renovated? There are also unresolvable problems in trying to assign property rights to resources that we consider to be common to all – such as the air quality. The private conception of efficiency also tends to ignore mass unemployment or rather redefine it as a maximising outcome of free choices taken by rational individuals seeking to achieve the best outcomes for themselves and their families. Accordingly, mainstream economists claim that unemployment is largely a voluntary state reflecting the free choice of workers to trade-off income for leisure (non-work). Rational individuals consider the benefits they gain from not working, which they construct as enjoying leisure against the costs arising from the loss of income. They are conceived as continually monitoring the wages on offer and adjusting their labour supply to maximise satisfaction. There is no hint that the economy may not offer sufficient jobs, which would render these choices, if they do indeed occur, redundant. Mainstream economists further claim that this individual choice is often distorted by the provision of income support payments by governments to the unemployed. They claim that if the government withdrew these benefits then it would alter the calculation individuals make when choosing to remain unemployed – that is, leisure would become more ‘expensive’ relative to work once the subsidies against job search (the income support) are withdrawn. In other words, they at various times deny that mass unemployment impairs the efficiency of the market, while at other times, they claim that government income support payments distort efficiency by perverting the labour-leisure choice of individuals. In the recent crisis, we have seen mainstream economists regularly redefine what is they claim to be the ‘efficient’ or full employment level of unemployment. … some of the bloc’s weakest economies are operating relatively close to full capacity … For example, the latest commission estimate is that the Spanish gap is just 4.6% of gross domestic product, despite nearly 27% of Spain’s labor force being officially unemployed … The commission believes that the “natural” rate of unemployment — if the Spanish economy were operating at full potential — is 23%. Similar claims have been made about other nations during the crisis. It is inconceivable that a progressive agenda should accept that a state of mass unemployment where 25 per cent of available labour (and in come nations more than 50 per cent of its available youth workers) are idle could constitute ‘efficiency’. This perversion of the concept of getting the ‘best’ out of available resources has, in the Eurozone context, been refined to the point where price stability is the top priority and politicians judge success according to adherence to arbitrary financial ratios. They tolerate mass unemployment as if there is no choice. Further, economists measure success in terms of Gross Domestic Product (GDP), which measures the total flow of spending on goods and services over any given period valued at market prices. We continually use GDP as if it measures anything that really matters. It is a vastly imperfect measure of societal well-being. According to this measure, an economy can achieve high rates of GDP growth by producing large quantities of military equipment, while polluting its natural environment, subjecting its workers to gross violations of human rights and enduring mass unemployment, high levels of income and wealth inequality, and elevated levels of poverty. Another economy can achieve low rates of GDP growth, but provide high levels of first-class health care, education and quality of life, with reduced negative impacts on the natural environment, an advanced sense of human rights, reductions in income and wealth inequality, and full employment. The neo-liberal vision tells us that the former economy is the more successful. In this vision, discipline and sacrifice are eulogised even as poverty rates rise and a generation of youth is rapidly becoming dislocated from the normal pathways that provide for individual prosperity and maintain social stability. Of course, discipline is a moving feast. The banksters and financial elites have different rules for themselves about what sacrifice and thrift is required. The neo-liberal narrative also demands that we conclude that our own individual outcomes are dislocated from the success of the system and so our success and failure are both represented as due primarily to our own efforts. Similarly, the unemployed are seen as being responsible for their jobless status, when in reality a systemic shortage of jobs explains their plight. For example, progressives timidly advocate more gradual fiscal austerity – the so-called ‘austerity-lite’ approach – when they should be comprehensively rejecting it on the basis of evidence that it fails, and advocating larger deficits to solve the massive rates of labour underutilisation that burden most economies. The euro Groupthink is so strong that progressives design all sorts of solutions to the crisis that will preserve the euro, when in fact it is the euro that is the problem. Progressives and conservatives are hostage to the same erroneous vision about the way the economy operates; yet the public is compelled to believe there is no alternative to the damaging economic policies being introduced. Once we reject this individualistic conception and reintroduce the notion of society a range of alternative narratives are available. In Part 2 (tomorrow) I will present the progressive vision and how it conditions the way we think of efficiency. Once we break out of the neo-liberal constructs and refocus our attention on Society rather than the individual then the way we appraise policy options also changes – it becomes enriched with new possibilities and understandings. We enter the progressive world and leave behind the austerity nightmare that neo-liberalism has created. I’d say it is less to do with the concept of efficiency and more to do with the difference between the roles of the private and public realms. The job of the private sector is to be efficient. In particular the job of the private sector is to *eliminate* jobs by automating and innovating. That way it drives productivity within its sphere. But the efficiency first approach means that it leaves gaps that are ‘not profitable’. The job of the public sector is to ensure a particular outcome and ensure that the inevitable holes created by the private sector are filled in. So it regulates the environmental issues, ensures that everybody has a job, everybody is educated and their health looked after. These are universal time-constrained functions that cannot be handled ‘efficiently’ all the time. The job of the private sector is to be efficient, but it is very often ineffective. There are times when things that need doing just don’t get done. The job of the public sector is to be effective – to ensure that something that needs doing always happens regardless of the current market conditions. And that means at times efficiency has to come second to getting things done. I remember reading a statement by JR Galbraith in one of his books that the distinction between private and public is a little illusory. After studying MMT and reading a bit of Ha Joon Chang I have put my own interpretation onto this. Most of the successful businesses in the world have benefitted either directly or indirectly from public subsidy. H Y Chang cites microsoft as receiving a 70% subsidy for years. The Railways in Britain received less subsidy when nationalised than they do now, in real terms, whilst in private hands. It makes sense if you understand that government money is an asset, and bank loans are a liabilty to businesses. Both private and public bodies are going to succeed and grow better with government subsidy. One example in Britain in the seventies was the subsidy to business for sending young people onto day release training courses, there are many others. The best example of a public institution in Britain is the NHS, a real leveller, providing direct government money via healthcare. The key thing about nationalisation for me therefore, is not about what money it receives but how it id distributed. Nationalisation od course, pushes all of the money into the service and good wages for the people who work in them. The non rent/profit nature is the key thing, hopefully no one creams off money and pops it into a tax haven. Privitisation has the opposite effect, government money ends up in private hands. One good example that I have links with is the care home racket in the UK. Many of the care homes where I live have been criticised for neglect of the elderly or inadequate care. They take the money, and skimp on staff and the service. There are many other examples. So the inefficiencies are both real and monetary in private hands most of the time. In America Reagan berated the ‘welfare queens,’ he didn’t mention the welfare children who weren’t responsible for the conditions they were born into and were harmed by his policies and those of Bill Clinton. Progressivism seems to me to have come in increments, the main obstacle being the British free trade system and its bankers. The bankers seem to be in charge now but just maybe their hold on the world is subsiding. I hope that the work that you are doing will be part of a new agenda. Maybe these people that you call “progressives” should be called liberals. Isn’t there a distinction between a progressive and a liberal? Maybe in your diagram of the people and planet being subservient to the economy, you should change the word economy to BANKERS. Just joking. “Socialisten houden van de mensheid en liberalen houden van mensen”= “Socialists love mankind and liberals love people” is something of a Dutch political cliché. I would like to say that economic liberals love people of whom they can make a profit. Economic liberalism is all about favoring certain individuals, those who have the most property and the highest incomes. In the market every dollar is equal. The antithesis between individualism and collectivism is a false one. If you serve the interest of the entire collectivity, you benefit all individuals. If you serve the interests of all individuals, you benefit the entire collectivity. A collectivity doesn’t exist separately from the individuals that compose it, and the individuals together compose the collectivity. The real political conflict is about which individuals comprising a political collectivity should be favored. Liberals tend to favor those who have the most, and socialists those who have the least. It isn’t really about the size of the pie only, but also about the size of the slices. The size of the pie is an abstraction, a statistic. What matters to us is the size of the pie that we ourselves get. Liberals prefer to talk about the size of the pie because they have no interest in reducing the biggest slices and augmenting the smallest slices. Ultimately, there is something deceptive about neoliberalism. There is all this talk about freedom and individualism, but a lot of that conceals class interest. Moreover, there is some correlation between income and freedom. If your income is just high enough to purchase the barest necessities, then you are less free than someone whose income allows him to travel and to purchase some luxuries. Before WWII, Brits were as free to travel abroad as they are now, but very few of them did because they couldn’t afford it. Freedom is not the same as opportunity. The ‘efficiency’ word bandied about these days is only loosely coupled with reality. Free market paradigm for efficiency is to optimise towards immediate price efficiency and ignore the rest of the real world constraints and other domains for improving efficiency. Take the software and hardware industries for example (which really should be a strong point of ‘free markets’ but of course this is an illusion). Investment in quantum computers, asynchronous architectures, memristors pales in comparison to the investment made in the next revision… smartphone, tablet, notebook. This market cannibalises itself as the technology soon becomes commodotised and profit margins fall. Technology starts to duopolise/monopolise and innovate less. And software, start by talking to a fellow whom writes compilers, lays out the language specification for computer languages they are always saying if they had enough manpower we could really re-write a load of the software architecture that’s out there. Then we’d have more secure software that works faster and ‘efficient’ from that perspective. This is a useful critique of the misuse & overuse of a concept, efficiency, minus context to give it meaning. However, the semantics still need some work, Bill. Whole swaths of military & engineering already refute a focus on efficiency over resiliency. They mostly ignore economics writings as inscrutable nonsense, but PRESUME that people with degrees in other fields know what they’re doing. There hasn’t been any net growth on planet Earth in 4.5 billion years, aside from cosmic dust, meteorites & comets. What people call growth is nearly always recombination. And no, everyone does NOT know what economists “really” mean when they use institutional jargon. There very fact that NeoLiberal nonsense is ascendant proves that we are nowhere near reaching coherence in alternate messaging. I think I agree with everything you mean to say, having met you & followed your writing for years, …. and yet I have to say that your wording is NOT anywhere near portable enough to be acceptable to a majority of the institutions and groups I run into, from scientists to bureaucrats to plumbers to religious fanatics. We need a few sentences that will be interpreted the same way by a member of your various Academies of Science ( e.g., http://www.atse.org.au/ ) as well as by your average union worker (as well as by all the tens of thousands of people getting unique university degrees). Until then, it will remain too easy for politicians to hopelessly distract, confuse & conquer diverse audiences with sophism instead of adaptive semantics. If data is meaningless without context, then surely convergent meaning is homeless without aggregate coherence? It’s stunning how ‘Demented’ that Thatcher speech sounds rehearing it after many years. In Thatcher’s case it stems from her methodist background and the 19th Century moralising tone of ‘self reliance.’ Of course, the idea that a benefit claimant is sponging of tax-payers is propagated by Labour as well as being used by the Tories as a rechanelling of anger from the real issues. The continuously and madly vilified Corbyn had some great progressive suggestions about new models of nationalisation along co-operative lines. Of course this has been lost in the fog of war between the different factions of the death spiralling labour Party. Now he’s being criticised as having no policies by his former economic advisers! All spoilt because McDonnell won’t simply say “and we’ll use the Ways and Means Account to mobiles this vision”. He’s still talking numbers and still channelling through a ‘national investment bank’ that will ‘mobilise private investment’. Or PFI for the 21st century as it ought to be known. I still reckon telling people the truth is easier politically. “Let us never forget this fundamental truth: the State has no source of money other than the money people earn themselves. If the State wishes to spend more it can do so only by borrowing your savings or by taxing you more. And it’s no good thinking that someone else will pay, that’s someone else is you. There is no such thing as public money, there is only tax-payers’ money”. This is so right. My comments are not criticims but elaborations. Take the unresolvable problem of air quality. This problem is not entirely unresolvable if you can accept the so-called solution. Tokyo is one of the worst polluted cities in the world and private enterprise has set up O2 kiosks so that people can pay for access to inhalations of O2 to refresh themselves. The situation is obviously ridiulous. Don’t tackle the problem; bypass it instead. The 1950s was certainly not a nirvana. In the US, it was a period of stifling conformity. And it wasn’t a period of Keynesian economics either. This must be emphasized. Samuelson certainly never thought it was. Corporations paid their workers relatively well, but there was a price to pay. Whyte, in his Organiation Man, interviewed engineers whose main concern was whether their lives amounted to anything, whether they were doing anything worthwhile. This indicates that they had few if any money worries, but the corporation wasn’t helping them in any other way. Those going to CEO interviews often found that their wives were also interviewed (informally), as they were expected to be company ambassadors albeit unpaid ones. Sometimes the man didn’t get the job because his wife didn’t come up to scratch. Eh?!!! Whyte has a wonderful chapter setting out how to cheat on personality tests, which were often given to job applicants. I have studied and taken such tests. The interpretations usually given to results by the firms using them do not bear reputable psychological examination. In short, they are completely absurd, as often are the tests themselves. On ecosystem (self-)regulation: neoliberals sometimes refer to the ecosystem as an example of self-regulation and extol it as an example for emulation in human affairs. Strictly speaking, the ecosystem does not regulate itself. It contains self-regulating subsystems. Let me take only one. Predator-prey relations (nicely characterized by the Lotka-Volterra equations, which should make neoclassical economists happy) are an example of a self-regulating system – such as the spruce and the spruce budworm. How might this relationship translate to human social systems? How about: the 1% are the predators and the 99% are the prey. While the individuals comprising such relations are “part” of the system in one sense, in another, they are not. Biologists often talk eliptically. Such locutions should not be taken literally. To do so is take on board, wholesale, social Darwinism, which seems to form part of the neoliberal outlook. The social Darwinism underlying a good bit of neoclassical economics must be rejected. A good historical source is the critique of William Graham Sumner’s position by Lester Warde (early 20th century). It is of historical interest that the president of Yale, where Sumner worked (like Tobin after him), tried to fire Sumner because his social Darwinist views were so extreme, but discovered he couldn’t. Regarding the diagram, I am not convinced that it works as intended. While acknowledging that data and graphics do not speak for themselves and need to be incorparted into an explanatory/interpretive framework, after this is done, no matter how good the interpretive framework, I feel that the diagram itself remains a tad confusing to the uninitiated. Example: the function(s) accorded the arrows – unconvinced it(they) is(are) clear. But I may be wrong. Ways and Means Accounts are used by the likes of the Bank of India and similar States that have historic British connections. Yet the ploy worked. A foolish electorate and it’s options are soon parted. Roger Erickson: If I am not mistaken, the reason that the electorate “bought” the Thatcher arguments is that the so called “free press” had been working very hard for many years to “educate” them in this regard. Hard-working “think tanks” had worked out the lines to be taken and the media pushed them relentlessly. In those days the print-media were supreme and Rupert Murdoch ruled the roost. Bill, you fail here to describe exactly what measure of “efficiency” is being used to argue the efficiency of free markets. For example, the efficiency of an engine is the work output of the engine divided by the energy content of the fuel source. Thus two like quantities are divided to get a fraction usually expressed as a percentage. It seems implied by some points you make that efficiency here is the ratio of actual GDP to some estimated “potential” GDP, correct? Seems immediately to be a category error in that the quantity of interest is actually real world benefits to consumers, rather than money which is a compound of benefit and price. It would seem useful to actually give a mathematic formulation of Neo-liberal efficiency to ground this discussion. Another thing she said was “you have to save before you spend”. Perfectly reasonable advice to a private citizen, but nonsense for a sovereign currency-issuing government.